Zimbabwe’s Government of National Unity (GNU) was formed three and a half years ago, a month after Barack Obama was sworn in. It is difficult to reach a thumbs up or down appraisal of the GNU before its final chapter is written. The brutal election of 2008 that preceded the GNU was the nadir in a decade of bloody political persecution. The respite from violence has been an immense relief all by itself. But even in absolute terms, the GNU glass is half full. There has been a degree of normalization–in economics, services and civics. Hospitals are no longer sending women in obstructed labor home to die. Schools are open, much of the time. There is a national human rights commission. The question now is whether this normalization is durable, or merely a lull in the country’s fratricidal politics. The partisan shrillness of the country’s newspapers reflects the unresolved conflicts that continue to shape Zimbabwean society. 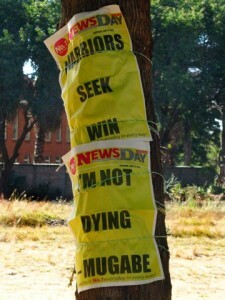 Most hysterical are the headline-teasing posters pasted to trees throughout Harare, condensing fears and hopes into 60-point font screams, rendering the GNU a lurid soap: “Mugabe In Despair,” “Tsvangirai Wins,” “Mujuru Speaks From The Grave.” The posters are replaced every morning with something still more high pitched. The high dudgeon of the headlines betrays the existential crisis beneath Zimbabwe’s thin veneer of normality. The electoral time bomb is ticking once again. Mugabe may well exercise his power to call a snap election in 2012; if not, both the presidential and parliamentary terms expire in mid-2013, little more than a year away. There is no reason to believe that the apparatus of political violence has been disarmed; indeed, the Zimbabwe Election Support Network has expressed concerns that militia bases are being reactivated. Meanwhile, Mugabe’s mortality hangs over the GNU, and the country, like the sword of Damocles; ageless for so long, the official photo hanging in airports, post offices and police stations appears suddenly dated. Is there a way to begin to normalize Zimbabwean politics? Zimbabwean analyst A P Reeler identifies the absence of “happy losers” as a critical impediment to the success of the country’s democracy2. The peaceful transfer of power is considered a litmus test of democratic consolidation. Only when the defeated party yields, with a begrudging appreciation for the role of opposition politics and an eager eye on the next election, can democratic turnovers take place. “Happy losers” are fostered by strong democratic institutions and the rule of law, but this turns the problem into one of chicken and egg. After thirty years of single party rule, the emergence of “happy losers” requires a fundamental shift in attitudes, an act of imagination: the contesting parties must contemplate the possibility of their defeat, so that when it arrives it is bearable. The 2008 election made losers of everyone. The two MDC factions jointly won a slim majority in parliament, but were unable to form an effective coalition. Tsvangirai was compelled to accept the junior role of prime minister despite having won more votes than his rival in the only election in which they faced each other. Mugabe, meanwhile, was returned to the presidency (possibly at the insistence of the so-called “securocrats”) but conceded the hollowness of this victory by acceding to the GNU. This deeply unsatisfying and unjust compromise nonetheless may, by previewing the experience of an electoral loss, help to recalibrate the expectations of Zimbabweans. An election is not simply a pitched battle in which the stronger survives and the loser perishes; it is a contest structured by rules. (The principles and guidelines governing democratic elections laid out by the Southern African Development Community, or SADC, are a good place to start.) By setting limits to acceptable conduct, the rules also establish broad parameters for the range of legitimate outcomes. For example, the rules imply that the contest is not entirely binary, us-or-them headlines notwithstanding. The party that “loses” will still be part of government–support for the two parties, as best as can be appraised in the absence of up-to-date polling, is divided evenly enough to likely maintain a rough balance of power in the next parliament. Both parties will survive the next election, unless one is permitted to literally annihilate the other in the process. The presidential election, however, is categorical: only one candidate can win. After thirty-two years as head of state, Mugabe may be incapable of contemplating defeat. If 2008 shook his confidence, he appears to have since doubled down on the conviction that he alone is the legitimate leader of the country. (Many see the death of General Solomon Mujuru as a stratagem to undermine his wife, Vice-President Joice Mujuru, as a potential successor). Perhaps all that can be hoped is that the GNU has afforded Zimbabweans an opportunity to compare and contrast political leadership, to get an obscured glimpse of what life after Mugabe might be like. Tsvangirai’s tenure as prime minister has not been spotless–he continues to be outmaneuvered by Mugabe more often than not, and has been drawn into minor personal controversy. The election will highlight another difference between the erstwhile prime minister and the president: Mugabe now seems capable of only the bare minimum of campaigning, while Tsvangirai–almost thirty years younger–is an active and able campaigner. Unfortunately, the GNU increasingly resembles a continuation of Mugabe and ZANU’s autocratic governance by a different name. The government has failed to undertake even the most pressing reforms (amending the draconian Public Order and Security Act, removing dead voters from the voting roll). The national broadcast media remain relentlessly partisan. For Jacob Zuma and other SADC leaders, Mugabe has long posed a grave challenge with little or no reward: direct confrontation with such an articulate and august statesman was politically costly, with little hope of a breakthrough great enough to recoup the expenditure of political capital. It is possible that Zuma and others also believed that Mugabe provided a measure of stability in a divided country. The circumstances have changed. Mugabe’s death is now a subject of daily speculation, while infighting in his party is at its highest levels since Mujuru’s death in August of last year. Under the status quo, Mugabe will do what is necessary to secure another presidential win, and then either retire or die in the saddle, leaving a vacuum in a party with a demonstrable penchant for violence. There are rumblings of a coup should Tsvangirai win, which would destroy the region’s democratic credibility. The status quo is not stable. SADC would do well to adjust the message it conveys to Mugabe–in public or behind closed doors-accordingly. The consequences of another brutal, stolen election will be grim, making a mockery of “happy losers” and turning shrill headlines into prescient warnings. We will definitely see the hysterical headlines but I doubt very much there will be any happy losers. You might like to qualify “in the only election in which they faced each other” to clarify that you mean “in 2008.” The June 2002 presidential election was possibly also won by Tsvangirai but ZPF was able to rig the results more effectively (in the absence of the V11 provision, they could manipulate the results at constituency level rather than at polling station as they had to do in March 2008 – the latter a process which required 5 weeks to rig a <50% result for Tsvangirai).